If anyone thinks there's a better episode of Angel than the one where he turns into a muppet, I'm willing to fist fight over it. Also praising My Little pony for "embracing lore" despite being "a dang toy commercial", when having an overarching, often multi-media, mythology given to the toys is bog standard practice for toy tie-in fiction is kind of hilarious. Mordum wrote: If anyone thinks there's a better episode of Angel than the one where he turns into a muppet, I'm willing to fist fight over it. I know right? It's the first episode that pops into my head. As for the Boom finale, I thoroughly enjoyed it. Eggman's legion of Doom was great. That 'not Ikea' bit was amusing. Thorton's Shadow, while maybe leaving something to be desired, did a sufficiently entertaining job as the one serious character in the show. I look forward to seeing more of him. What I can take away from this is that Shadow seems to think somewhat highly of hedgehog-kind if he figures Sonic to be a disgrace to it. Could have something to do with that whole ancients business that was just barely mentioned in the games. Probably won't learn anymore than that, but that's fine. That's giving the Boom show far too much credit, I think. Dude, can you just let people enjoy what they enjoy? It's really starting to come off petty now. Mavrickindigo wrote: Question is, would Freiberger and friends be able to have Shadow's past in there with respect? I very much doubt it since none of the other characters have had their back stories explained, Sticks being the biggest example. Boom seems to be more focussed on the present and any history the characters have is deemed not important unless it serves a joke, a reference (Knuckles being from Angel Island), or the plot of the week (Stick's guarding the door to the Frog people cave). Though Cubot's origins was an exception. Don't worry, guys, I got this. Village wrote: I had written a long response. But I feel like I need to do work. I will leave it at. It's just another example of SEGA screwing things up. Sonic Synergy could have been a cool thing, and Sonic Boom could have been a fun thing, but they had to shove them together and force ROL onto the Wii U.
I blame the Nintendo exclusivity deal. It's not like it did anything good for either SEGA or the fans. And it was SEGA's fault for signing such a thing and expecting developers to be able to switch gears like that. Well let's just continue to whine about it because that's changed so much in the past. I mean... whining is delaying Fire & Ice right? Poor sales too, but those were likely the result of hearing lots of people whining about them. Despite him being my avatar now, I've not actually seen the episode. I haven't even seen anything since episode 26. At some point I'll marathon but I just... it's so hard to get through this show. I can sit down and at least enjoy Underground and AOSTH for what they are but this thing is so... unpleasant. I never think any of the jokes are funny, the animation is always so stiff, I can't name a single character that feels like more than two seconds of thought were put into them, the environment being the same every episode means there's nothing interesting to look at, etc. etc. etc. I feel like this episode may have benefited from being 30 minutes. Toby wrote: Well let's just continue to whine about it because that's changed so much in the past. Your on a forum. Folks will criticise. 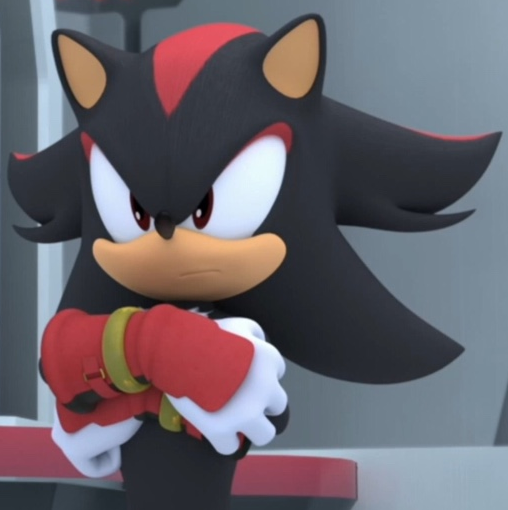 Honestly , I Love Shadow'S Voice. 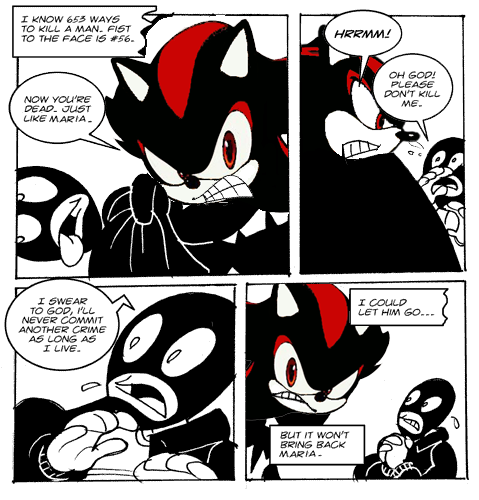 He is a spot on Parody of the "Ow The Edge" Anti-Hero CLiche, everyone is Shadow making out to be , while the rest of the cast just doesn't take him seriously, except Eggman.